Merle Travis was one of the greatest and most influential guitarists the world has ever known and is a very important figure in the history of American music. The name Merle Travis, his songs, and guitar style (thumbstyle) are well known and emulated throughout much of the world. The "Travis-Picking Style" can be heard from Finland to the British Isles and from France to South Africa. His music is timeless. It transcends generations, styles, and fads. It encompasses many types of music from hillbilly, western and folk to pop standards, jazz, Dixieland, boogie-woogie, Cajun, honky tonk and country. Travis was a prolific songwriter and his songs are still being recorded by many of today's young artists and brightest stars. "Smoke, Smoke, Smoke That Cigarette" written for Tex Williams was the first million seller for the new (at the time) Capitol Records Company. His "Sixteen Tons" which was recorded by "Tennessee" Ernie Ford was the first record to sell a million copies in thirty days! Merle was a pioneer in the truest sense of the word. He was an extremely creative musician, an inventor, a designer, an innovator, and a trail blazer - ahead of his time in many ways. He was one of the first to use the electric guitar. He designed the first thin solid body electric guitar with all the tuning keys on one side, which P.A. Bigsby built for him. This was the forerunner of the Fender guitar. This famous Bigsby guitar is in the Country Music Hall of Fame Museum in Nashville along side the well known Gibson Super 400 that has Travis' name inlaid in the fingerboard. Merle also designed the vibrato bar which Bigsby also built for him that became the famous Bigsby vibrato. Travis' son, Thom Bresh, has the first Bigsby vibrato ever built. Merle was in at least 36 western movies with Charles Starett, Smiley Burnette, and various other actors. He performed in the award winning film From Here to Eternity with Burt Lancaster, Deborah Kerr, Montgomery Cliff, Donna Reed, Frank Sinatra, and Ernest Borgnine. The name Merle Travis is in the Country Music Hall of Fame, the Songwriters Hall of Fame, and the Gibson Guitar Hall of Fame. His name and songs are also in the Smithsonian Institution where he performed several years ago. Merle Travis was many things -- guitarist, singer, songwriter, cartoonist, designer, composer, writer, raconteur, and historian of sorts. Most of all he was a wonderful human being who gave hours, months, and years of happiness to many people! In this DVD lesson, Marcel Dadi teaches 7 of Merle's greatest instrumentals: "Fuller's Blues, Cane Break Blues, Blue Bells, Saturday Night Shuffle, Memphis Blues, Cannon Ball Rag, and Walkin' The Strings". Included are 5 rare performances from 1951 of Merle playing "Nine Pound Hammer, Lost John, John Henry, Muskrat, and Too Much Sugar For a Dime". Here's a guitar lesson that is a must for all fans of Merle Travis! The only son of the legendary guitarist gives us an in-depth look at the famous technique that changed the course of guitar history. 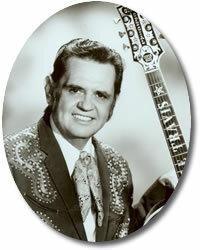 When Merle Travis passed away in 1983, we lost one of our most innovative and distinctive musical voices. Fortunately, his songs and fingerpicking style live on in the hands of his son Thom Bresh, a talented and dynamic guitarist who learned the real Travis-style guitar right from the source. Thom Bresh grew up listening to, and later playing with, his famous father and his skilled hands bear a haunting resemblance to his father's. He takes you -- step-by-step -- through Merle's timeless techniques, playing the famous 1938 Martin D-28 with the custom Bigsby neck that was passed on to him by Travis. By the time this powerful lesson is over, you'll have gained an understanding of the real Travis sound and will be playing such guitar instrumental standards as: "Guitar Rag, Cannonball Rag, Walking The Strings, I'll See You In My Dreams, Bugle Call Rag, Farewell My Blue Belle, and Hangin' With The Girls I Know." We are proud to present this lesson to the growing number of Travis enthusiasts and fingerstyle guitarists worldwide. It will make a valuable addition to the collections of all serious guitarists and historians, as it offers a rare opportunity to see and learn from the real-life continuance of a musical legacy! This DVD captures 35 years of rare film and TV performances by Merle Travis. There is not a fingerstyle guitarist whose playing has not been touched by Merle's style and technique. Titles include "No Vacancy, Nine Pound Hammer, Muskrat, I'm A Natural Born Gamblin' Man, Too Much Sugar For a Dime, Spoonin; Moon, Lost John, Dark As a Dungeon, Petticoat Fever, Sweet Temptation, John Henry, I'll See You In My Dreams, Midnight Special, Cannonball Rag, I Am A Pilgrim, Sixteen Tons, Smoke, Smoke That Cigarette, Barbecue Rag, I'll See You In My Dreams". Merle Travis' brilliant fingerpicking style inspired Chet Atkins and generations of country, folk, bluegrass and rock guitarists. Travis picking is a very complete use of the guitar: when you play steady, alternating bass notes with your thumb and pick melodies with your fingers you're playing lead, rhythm and bass all by yourself. But how do you keep that thumb-bass independent so it doesn't get derailed when your fingers pick the melody. Fred Sokolow makes it easy for beginners or intermediate guitarists by breaking it all down and teaching each song step by step. First you learn the melody, then add the bass, then add the syncopation that makes it swing. Split screen versions of the songs with close-ups of both hands will help you learn Travis style - it's a great introduction to fingerpicking! Songs include: "Nine Pound Hammer, I Am a Pilgrim, Windy and Warm, Whispering, Mack the Knife". Previously called Rare Performances 1946-1981 Vol 2 - Includes ""Silver Spurs, Texas Home, Why Did I Fall For Abner, Old Chisholm Trail, Catalogue Cowboy, Night Train To Memphis, Lost John, Nine Pound Hammer, John Henry, Wildwood Flower, When My Baby Double Talks To Me, Sixteen Tons, Cannonball Rag, Dark As A Dungeon, Rockabye Rag, That's All, Wildwood Flower, Lost John, Who's Sorry Now, Way Down Yonder in New Orleans, Backwater Blues". Songs include: "Cannon Ball Rag, Cincinnati Lou, Dance Of The Goldenrod, Dark As a Dungeon, Divorce Me C.O.D, Fat Gal, I Am a Pilgrim, I'm a Natural Born Gamblin' Man, Kentucky Means Paradise, Sixteen Tons, Smoke Smoke Smoke (That Cigarette), So Round So Firm So Fully Packed, Start Even, Sweet Temptation, When My Baby Double Talks To Me". Merle Travis Plays "Cannon Ball Rag"
By Merle Travis and Tommy Flint. Tommy Flint carefully and systematically teaches the world-renowned fingerpicking style developed by the legendary guitarist Merle Travis. Selections include: "Farewell My Blue Bell, Bar BQ Rag, Bicycle Built for Two, Bugle Call Rag, Country Shuffle, Cuddle-Up A Little Closer, Lovey Mine, Dance of The Golden Rod, Drakesboro, Coal Drag, Go Tell Aunt Rhody, Going Down the Road Feeling Bad, Good-bye My Bluebell, Got It, Green River Blues, Honeysuckle Sweet, I'm Thinking Tonight of My Blue Eyes, Walkin' in Beech Creek, Memphis Blues" and more! Merle Travis Plays "Guitar Rag"